Plastics represent a large majority of polluting debris that is found in the world’s oceans, which is an obvious consequence of producing such vast numbers of single use plastic and poor waste management. Plastic materials are polymers whose chemical structures allow them to be moulded into different shapes, when exposed to raised temperatures. Conveniently, plastics can be described based on their size, which is why we often talk about them in terms of macro or micro plastics (Munier, 2018). Plastics enter the oceans in many different ways; through our water systems, rivers, winds, tides, sewage disposable, and most notably through massive floods (Reiser, 2013). These modes allow the waste from populated areas to reach even the farthest lake, island or ocean paradise, and alter macro plastics into micro ones. Furthermore, the fishing industry is one of the most polluting industries in the world, responsible for 1 million tonnes of ocean plastic waste (Siegel, 2018). It is no wonder there are 5 large-scale gyres of plastic debris floating in our oceans, contributing to the macro and micro problem. Two things happen when plastic enters the ocean, either they float on the surface or they sink to the seabed. Both of which are incredibly problematic and allow the issue to become as far reaching as possible. The plastics that sink to the seabed are made of polymers denser than seawater, and obviously the reverse for the floating debris. While the dense polymers pose quite a threat, it is the buoyant plastics that are cast ashore or swept into the open ocean and accumulate in convergence zones like gyres. Fig. 1. 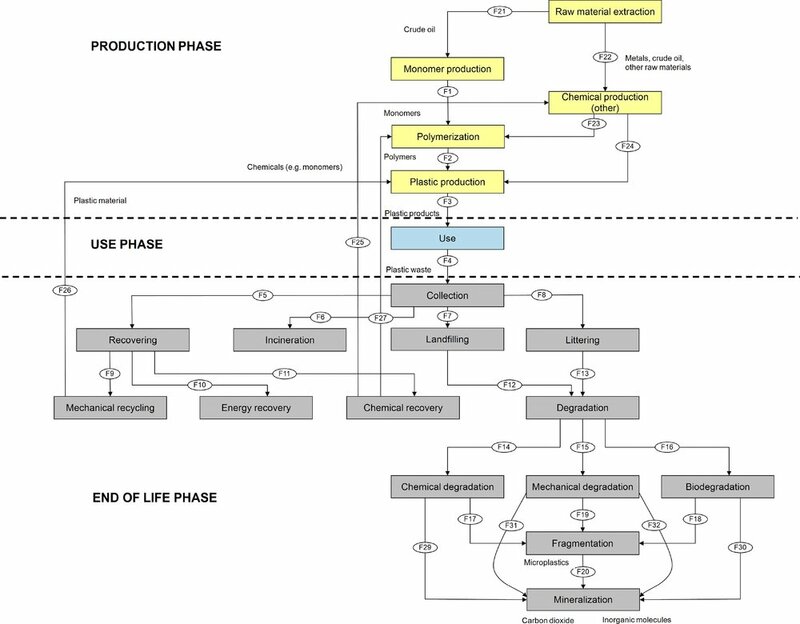 The life cycle of plastic products (excluding energy input and emissions) created in STAN (subSTance flow ANalysis) Software (redrawn from Source: [Lithner, 2017]. “F” stands for Flow and the number shown next to corresponds to the particular flow series (an automatic procedure incorporated in STAN)). What the hell are ocean gyres? “Gyres occur when airflows moving from the tropics to the polar regions create a clockwise rotating air mass, which then drives oceanic surface currents in the same direction.” (p.89, Siegel, 2018). Once the plastic waste has entered the ocean currents, the buoyant pieces begin to settle in islands of waste that float just above the surface (gyres). The largest one has been named the Great Pacific Garbage Patch and stretches across 600,000 square miles of the ocean. It is estimated to weigh in at around 79,000 tonnes with a further estimate of containing 1.8 trillion pieces of trash. 99.9 per cent of which is plastic. The plastic that is cast ashore becomes micro plastic due to the constant smashing against abrasive surfaces like rocks. While plastic that floats within the tides is tossed and churned by the waves. The other elements like UV rays and winds also act as a tool to help break down these macro plastics into micro ones. While a large proportion of micro plastics are created this way, there are several plastic materials that are actually designed to be less than 5mm, making them ready made micro plastics. Micro beads and nurdles are a perfect example of this. So now we understand a little more about how micro plastics actually become pollutants, but what further harm can they actually cause? Siegel claims thats the problem with micro plastics is largely due to the tiny pieces being mistaken for food. Ingesting these materials, Siegel suggests, causes energy depletion, premature death and therefore disruption of the natural reproductive cycle, and infertility (Siegle, 2018). The science on micro plastics is still in its infancy, and so even though we can see these problems evident in fish and other marine life, it makes us wonder what will happen to us if we continue to eat fish that are polluted with toxic, micro plastic particles.